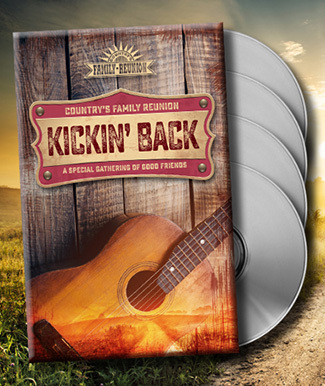 CFRC Videos - Country's Family Reunion "Kickin' Back"
Country's Family Reunion "Kickin' Back"
John Rich, Randy Travis, Lorrie Morgan, Phil Vassar, Joe Nichols, Rory Feek, Fiddlin' Carson Peters, Larry Stewart, Leona Williams, just to name a few. And the result is Country's Family Reunion, Kickin' Back, an almost 7 hour DVD collection for just $29.95 plus shipping and handling. Brand new songs, like "Good Lord and the Man" by John Rich... Brand new stories, like the time that Larry Gatlin chastised Mark Wills about his Opry attire... Moments captured on camera that will last a lifetime, like Ashley Campbell's heart-filled song she wrote for her Dad, Glen. All on 5 DVD's with almost 7 hours of incredible country content. So many artist attended... you'll also hear from T-Graham Brown, Bill Anderson, Gene Watson, Jeannie Seely, Linda Davis, Randy Travis, Larry Gatlin, Duane Allen, Carl Jackson, and more! And did you know that the show that airs on TV is just a portion of the complete series? In fact, the TV episodes you'll see on RFD are less than half of the entire 7 hour series... There's so much you WON'T see on RFD. Also, included in this collection is the very special BACKSTAGE DVD with rehearsal moments, more intimate stories and more songs that didn't make the main stage. And it's all yours for just $29.95. This show was so much fun, and we had so much fun Kickin' Back. You'll love the series as much as we loved making it. Order yours today!